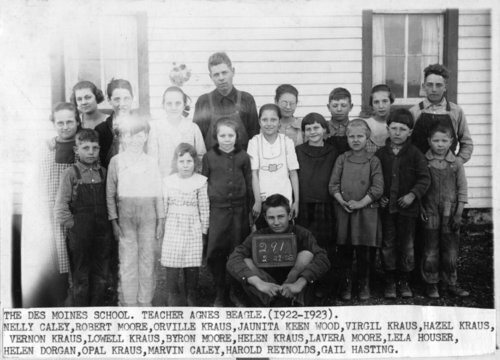 Photograph of school children standing beside the Des Moines School in Wabaunsee County, Kansas. Some of the students are identified as: Nelly Caley, Robert Moore, Orville Kraus, Juanita Keen Wood, Virgil Kraus, Hazel Kraus, Vernon Kraus, Lowell Kraus, Byron Moore, Helen Kraus, Laverna Moore, Lela Houser, Helen Dorgan, Opal Kraus, Marvin Caley, Harold Reynolds, and Gail Hasting. The teacher is identified as Agnes Beagle.